Happy Halloween from the little puppy dog and her fire fighter friend! 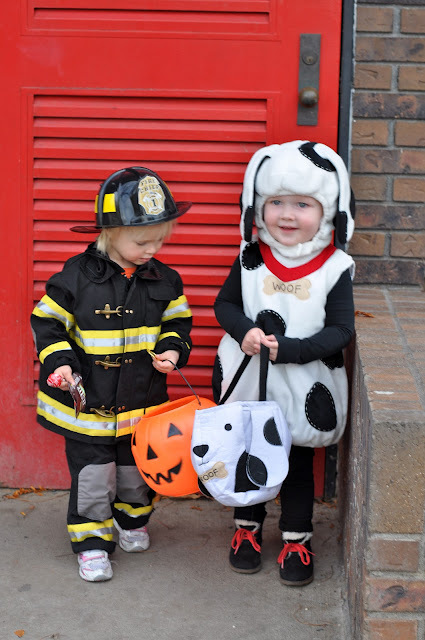 We had so much fun taking these two little spitfires trick or treating last night. Since they were a fire fighter and dalmatian, the first stop was the firehouse. With the combination of excitement, candy and running around in the dark, it got a little crazy, but they had such a fun time. Harper seriously woke up before the sun with excitement, "We are going trick or treating with Kylee?" It is one of those great things about being a parent to see such anticipation and joy in your child's eyes. Hearing her shout with glee, "Twick or TWEEEET!" and a polite "thank you!". 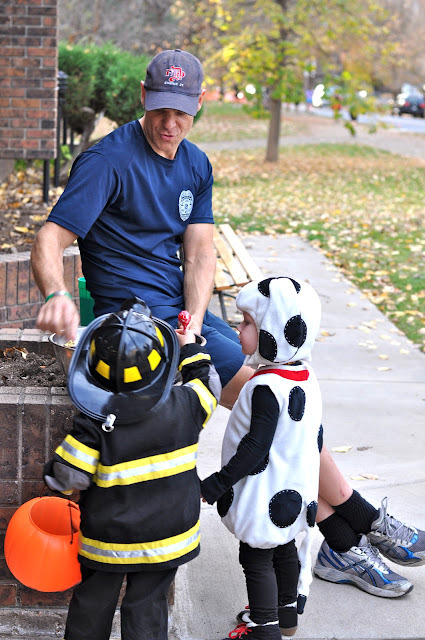 Hope your Halloween was spooky and fun! p.s. photos are a little blurry...due to very wiggly little girls!